A new portrait of Thomas Witlam Atkinson? Could this unloved, rather forlorn oil painting be a portrait of Thomas Witlam Atkinson? There are a few circumstantial details that could connect it to the great traveller, but not enough to make a definite attribution. If it turned out to be a portrait of Atkinson, it would be the only one that has emerged to date. There is, of course, a single photograph of him, taken when he was ill, towards the end of his life. There are also at least two of Atkinson’s own drawings of himself, which appear in his travel books, although these are illustrations, rather than portraits. This is what we know about the oil painting. It was first brought to my attention by Helen Bonney, who noticed it online in the collection of paintings at Cannon Hall, near Cawthorne, outside Barnsley and who, based on the clothing, dated the picture to the 1820s. In the catalogue it is described as ‘Portrait of an Unknown Gentleman‘. It is not presently on display. Cannon Hall is the ancestral seat of the Spencer-Stanhope family. Thomas Atkinson was brought up on the estate, where his father William was the head stonemason. We know from various sources that Charles Spencer-Stanhope in particular, supported and encouraged Thomas from an early age and guided him towards a career as an architect. Helen Bonney drew the picture to my attention earlier this year and since then Sally Hayles has visited the museum several times, where she has had the opportunity to examine it out of the frame and under UV light. Thanks are due to museum staffer Louise Wright in particular for being so helpful. However, there is a problem with the picture. Its history is incomplete. Barnsley Council, which bought Cannon Hall in the 1950s and now runs it as a museum, says its records do not show when or how the painting was acquired. It may have been in the Cannon Hall collection since it was painted in the first quarter of the nineteenth century, or it may have been bought much more recently, even after the collection became the property of Barnsley Council. An expert who recently examined the unsigned painting out of its frame tells us that the frame is not original and that the nails holding it into the frame are only 20-30 years old. There is a blue chalked number on the back, but no-one can say what this means. Second, the painting is in oils on wood, which probably rules out Atkinson himself as the artist. There is no record of Atkinson ever painting in oils. He preferred to use watercolours, even for his most substantial paintings – although his son John William Atkinson certainly did paint in oils. However, John would have been too young to have painted this picture in the 1820s. 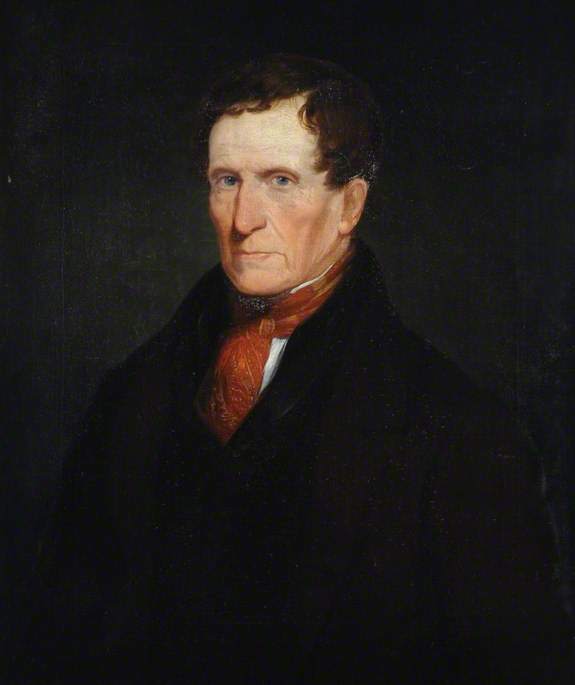 That having been said, the painting bears more than a passing resemblance to the photograph of Atkinson, although the former would have been completed at least 30 years before the latter. Third, the picture is not of great quality. The hands in particular are very basic and the folds in the clothing are poorly handled. Is there another possible candidate for the artist? Well yes, possibly. Like Atkinson, Abel Hold (1815-1896) was a local man also supported by the Spencer-Stanhope family. His portraits of several Cannon Hall estate workers – including Elkanah Clegg, a woodman, and Jonas Beaumont, the estate carpenter – can be seen hanging at the Cawthorne Victoria Jubilee Museum, only a mile or so from Cannon Hall. Could the ‘Unknown Gentleman‘ be an early picture by Hold? It is possible, but there is no way of knowing for sure. The other known portraits and paintings (mostly of game) by Hold are on canvas, which may rule him out. The dress of the sitter places it firmly in the 1820s, when Hold would have been a child. For now we will simply have to think of this as a mystery portrait that may possibly be the young Thomas Atkinson.